I made these dollhouse miniature flora round victorian gift boxes lately. These aren't new designs, but I always make a few little differences to each piece I make. Added a pink rose and brighter pink ribbon to this soft ensemble. In other news, my mom's disease has progressed, and she's currently awaiting to enter a clinical trial. This means more hospital visits on our end. I'm pretty quiet on social media these days, but I do post when I have new photos to share. I'm still checking and replying emails daily and do accept custom orders. I've currently completed one order and will resume working on a longer custom order which I have been working on and off. I'm so grateful to all of you who are so patient, and am always willing to wait for me to complete working on your orders. If you see anything that you'd like me to make but is out of stock, please email me instead. Thank you all so much for your patience and understanding. Hi everyone, finally I have another piece of work completed, in between the other customised projects going on. This has taken quite a while to complete, but I'm glad I managed to as all the other trio romantic cakes in my shop has been sold quite a while ago. I have always wanted to restock some. I have more ideas in mind! These romantic pink peonies mini cakes have a pop of lovely sweet pink color in the center of the flower. Do you also see the layered cake in the background? I'm still trying to complete the cake stand before listing it ^^ It's also another popular cake that has been sold out. The cake is about 1.6cm tall. Width is 1.2cm at most. Comes with a lovely glass dome cake cover. This set is available in my shop here. Hi everyone! It's been another long while since I updated. The lunar new year holidays came and went. Just a couple of days ago, I received this in the mail. 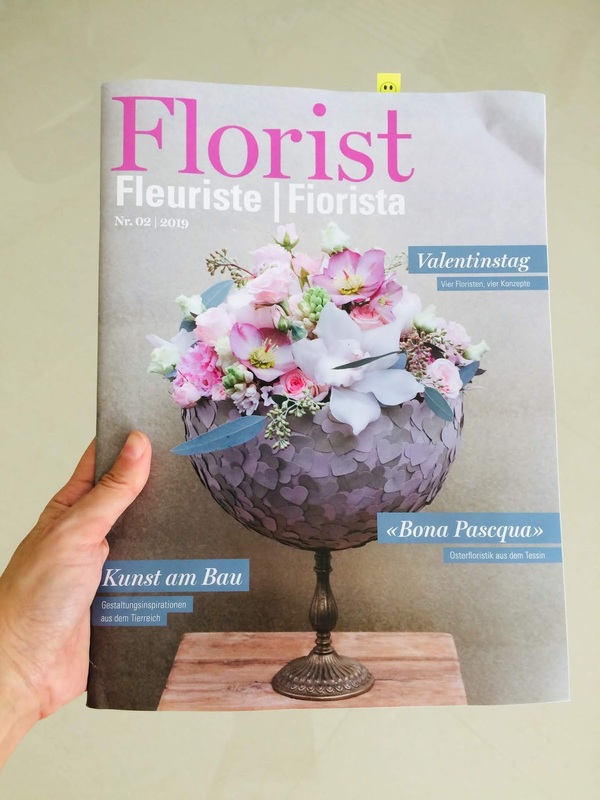 It's a copy of the Florist magazine - based in Switzerland. 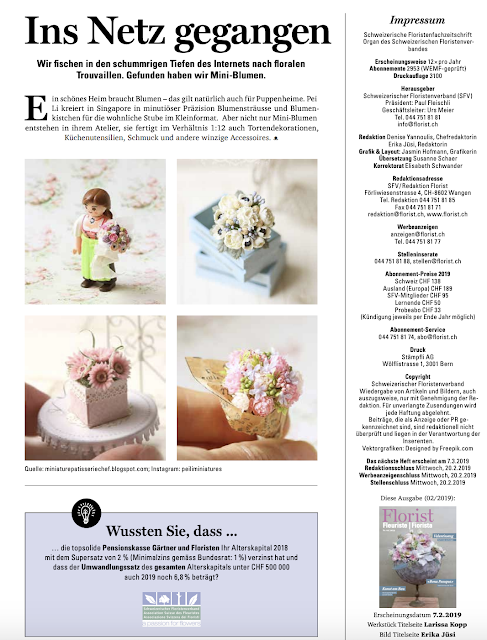 My miniature flowers were being featured in a flower magazine and I was thrilled beyond words. I am mostly working on custom orders these days, and I'm very thankful everyone is patient while waiting for their items to be completed. 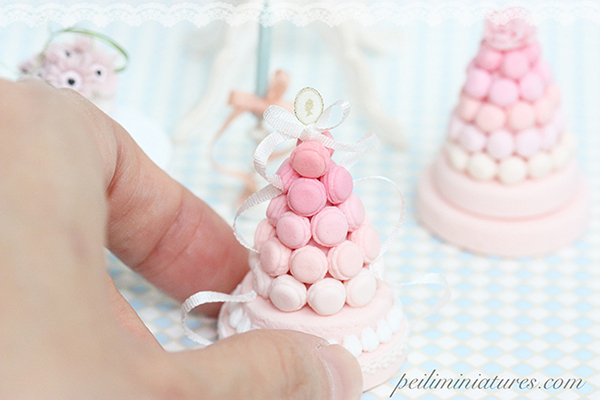 It's been a while since I made a dollhouse miniature macaron tower and I was surprised I had enough energy to make 2! I'm so pleased how they turned out. I'm still figuring out the whole photography situation. I took these photos at 3pm, where the sun was really bright. I thought I would have really bad ugly shadows, which would be the case at my old house. I'm very surprised these turned out OK. I'm not sure if it means 3pm is now my ideal timing to take photographs, but I'll try again next time. The macaron tower in the background is a custom work for a client and is still a work in progress...I'll take more photos once I complete that! The pink macaron towers are always very popular. While making these, I thought of making blue macaron towers, which I've never attempted. I wonder if they would be as popular. And here's another picture of it on the 3cm cake stand. It makes it look really grand. I'll have to restock those 3cm cake stands again soon! Hi everyone! I'm back :) It has been a week since my Macbook was brought in for a battery replacement. During this time, I had been busy working on custom orders. I also had some time to work on this pot of dollhouse miniature anemones flower. It has been a while since I made anemones flower, so it was refreshing to see how I would change their "looks". This time round, I made the petals more "open". How do you like this version of anemones? I'm loving the curls of the tiny ribbon on this. Every pot that I make is different, since I can't control how the ribbon curl would turn out. I'm also loving the white and blue tile background. I think it's the first time I'm using that for my photographs.